Mother India almost got an Oscar for best foreign film award: it lost by one vote in the third poll. During the shooting of the fire scene in Umra, Surat, haystacks were set on fire and Nargis was told to run in. There was a sudden change in the direction of the wind and the fire spread, with Nargis caught in the flames. Sunil Dutt, who plays her son in the film, rushed in and saved her. Apparently the two were married before the film released, but kept it a secret only because Nargis was playing Dutt’s mother. Dilip Kumar was originally cast as Birju. But since he had played romantic leads with Nargis earlier, it was felt that the audience wouldn’t accept the on-screen mother-son relationship. 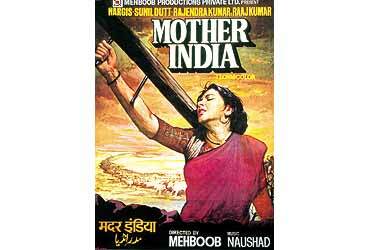 It may be exaggerating things a bit to describe Mother India as the mother of all Indian films. But it’s certainly the prototype of countless films made after it: Deewar and Ganga Jumna among the more significant. Strangely, it is itself a remake, an opulent one, of Mehboob Khan’s own Aurat (1940). Both critically acclaimed and universally liked, the second edition became perhaps the best known Indian film of all time. This epic saga of a peasant woman in newly independent India has a fairly simple storyline: Radha’s husband Shyamu abandons home, unable to work and ashamed, after an accident that leaves him without arms. Radha becomes the sole bread-winner and tills the land, despite all odds, with the help of her two young sons, Ramu, the good son, and Birju, the rebellious bad egg. Like Radha, a larger-than-life Mother Courage figure on whose shoulder rests the fate of her family and the villagers, Nargis plays the exemplary heroine of Indian cinema, carrying the film on her fragile shoulders—as she does the plough in the iconic poster. This is her film. A female Job, she faces starvation, storms, floods, and Sukhilala, the lecherous moneylender, chillingly played by the father of all villains: Kanhaiyalal. Nargis’s graph in the film moves from coy bride with downturned eyes, to motherhood, then Mother Earth and finally Mother India: her character takes on the symbolism of the "national mother" as well as that of the mythological mother goddess. The resonance of the film, responsible for its enduring appeal—beyond its epic-narrative style—is Mehboob Khan’s seamless incorporation of mythology into the film. In the opening image of a Nargis, old, sunbaked and parched like the land, she’s mother earth. She is Sita, as a wife, though her name is Radha. And finally, a Kali-like figure when she shoots her own son who has seduced and run off with Sukhilala’s daughter. 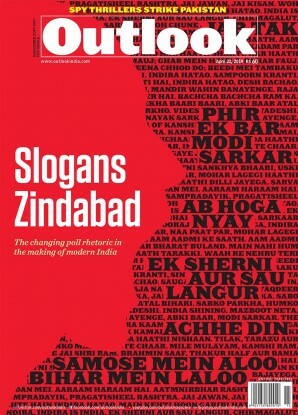 The secularisation of the Mother Goddess into Mother India follows the trajectory of Nehruvian nationhood, which absorbed the pre-Independence nationalistic emphasis on spiritualised motherhood and transformed it into secular patriotism. 25 leading Indian film directors drew up their personal lists of 10 best Hindi films of Independent India.